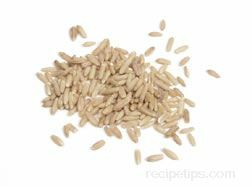 The whole kernels of grain, such as barley, buckwheat or oats that have been hulled, cleaned and sometimes roasted, but not cut or flattened. 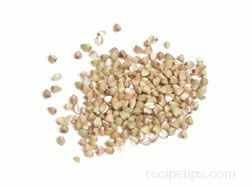 They are similar to barley and can be used in salads, soups as a thickener, and side dishes such as pilafs or casseroles. Groats are long, narrow and tan colored with a chewy texture that provides a somewhat nutty taste. The outer layer of the groat is known as bran. This grain can be sliced, which then makes it a steel cut grain or it can be steamed and passed through steel rollers to make it into grain flakes, such as oat or buckwheat flakes.